HANOVER, Germany -- Activists from the Ukrainian feminist group Femen launched a trademark bare breast protest on Monday targeting Russian President Vladimir Putin who unexpectedly said he liked the show. Putin and German Chancellor Angela Merkel. Four women, with obscenities in English and Russian daubed on their breasts and backs, broke through security as Putin and German Chancellor Angela Merkel were examining a stand at the opening of an industrial fair in Hanover, Germany, but were soon carried away by security guards. "As far as the action is concerned, I liked it," Putin told reporters when asked for a comment during a news conference that followed. 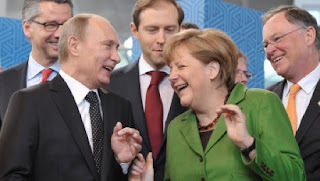 Photographs published by German media showed Putin and Merkel reacting to the unexpected protest with an apparent mixture of surprise and mirth. Putin came under sharp criticism in Germany ahead of his visit over unannounced inspections of foreign-funded NGOs. Merkel asked Putin to “give NGOs a chance,” earlier on Monday. Femen members previously bared their breasts in protest at Putin’s policies in March 2012, when three activists stripped to the waist at the polling station where Russia’s national leader had cast his vote at presidential polls.